SoftPlanet makes it possible for everyone to get free ThunderSoft GIF to SWF Converter download directly from our servers. There is no registration needed for downloading. 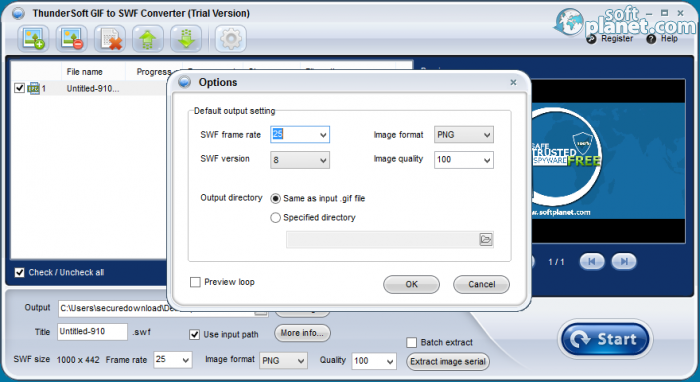 ThunderSoft GIF to SWF Converter 1.4.0.2 is a simple and straight-forwarded application, dedicated to converting image files to SWF one. You can download and try this app for free within 15-day trial period. Thus you will convince yourselves of its advantages. ThunderSoft GIF to SWF Converter v1.4.0.2 supports various image format like GIF, BMP, PNG, JPEG and JPG. In addition, you are able to add background music in MP3, WAV and WMA formats. Actually, adding a logo (PNG, GIF, JPG, BMP, ICO, EMF, WMF) is possible as well. Let's not forget that this app enables support batch conversion too. Thus you can convert multiple images simultaneously. ThunderSoft GIF to SWF Converter v1.4 is a very handy app for converting multiple images to SWF files at same time. It offers a user-friendly interface, which makes its working process very simple. 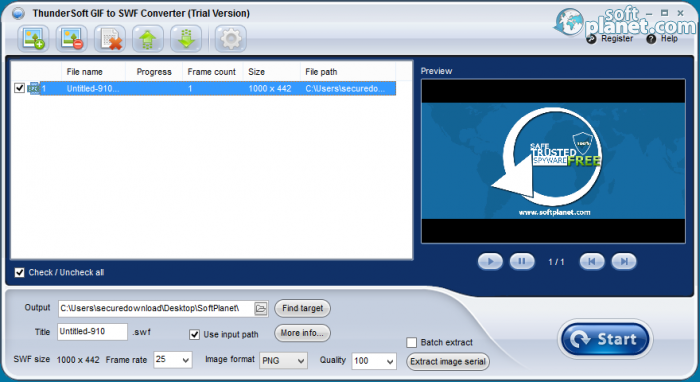 ThunderSoft GIF to SWF Converter is VIRUS-FREE! Our security scan shows that ThunderSoft GIF to SWF Converter is clean from viruses. The current version of ThunderSoft GIF to SWF Converter has been scanned by our system, which contains 46 different anti-virus algorithms. That ensures that ThunderSoft GIF to SWF Converter 1.4.0.2 is 100% safe for your computer.